Our proven 10 step process ensures that every cold call campaign is set up to deliver the best results. Once we get an understanding of your business, we design a lead generation service that delivers exactly what you need: qualified sales leads and appointments. Whether it’s Customer Acquisition, Lead Qualification or Appointment Setting, with RPMC’s Lead Generation Services, you’ll reach, or you could very well exceed, those target sales numbers – and you’ll do it efficiently and consistently. RPMC, Inc. will send you an email to schedule the kick-off meeting and the projected campaign start date. 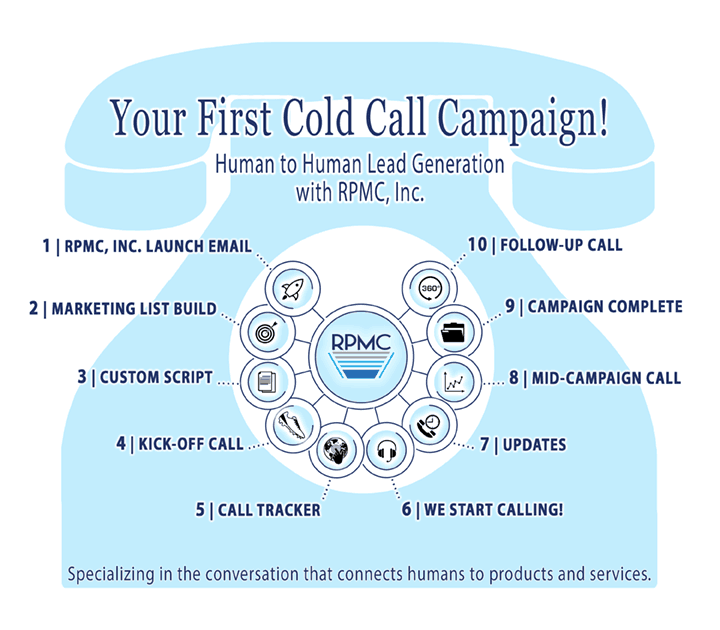 RPMC, Inc. will build your call list! You will receive a requirements form to help us identify your exact target market. Or we can begin with your current marketing list if applicable. We collect the information we need to create a customized cold calling script fit for your company using our script requirements form. This is our opportunity to start our sales relationship. We present to you the script we’ve created, and you help us sharpen it so we deliver the best possible pitch. We also discuss our sales process and how your offering synergizes with our strategy! You will receive access to your campaign call tracker through our company portal. Here you can see the call results and metrics recorded in real time. 6 | We Start Calling! This is our time to shine. We call each decision maker the agreed upon number of times to set up an appointment, offer that free trial, or deliver the call to action you prefer! We provide you with periodic cold call campaign updates regarding any new leads. Immediate action is suggested when following up. Mid-way through, we will discuss how the campaign is progressing and we will make any strategy adjustments we need moving forward. You will be notified when your cold call campaign is complete. Here you can refer to the full list we generate and follow up on any sales leads or neutral responses. Once the cold calling campaign is complete, we love to connect with you to discuss your feedback and any next steps.